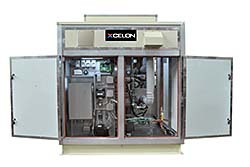 Xcelon achieves efficiencies up to 98 percent by utilizing a high efficiency hyrdonic boiler, according to the company. Available with an 800 to 1,200 MBH heating capacity. Features a factory-charged, closed loop, 35 percent glycol mix for freeze protection with no separate water supply required. Offers airflow of 4,501 to 10,000 CFM.